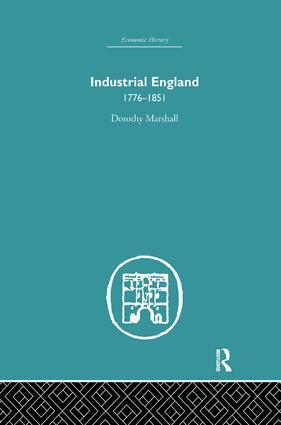 Dr Dorothy Marshall covers a vital period in English social development, during which the traditional social hierarchy of order and degree was giving place to a class society marked by the growth of a self-conscious working class. The author shows how, between 1776 and 1851, industrialization brought about major changes in the structure of society, so that by 1851 the outlines of modern urban and industrial society had been irrevocably drawn. She examines the social implications of the Industrial Revolution, referring in particular to the growth of urban society, the repercussions on the rural community and the resulting alterations in the social structure. She examines upper-, middle- and working-class opinions on such topics as religion and education, and traces the effect of the economic and social changes on the constitution and on political life. In the final chapter Dr Marshall describes the way in which the abuses of the new society brought about the demand for parliamentary legislation to deal with the injustices of the Poor Law, the factory system, and the problem of sanitation. This fascinating book was first published in 1973.